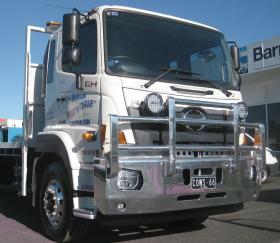 Hino GH & FM 4 post hi-tensile polished aluminium heavy duty FUPS compliant bull bar with heavy duty box style uprights. One piece heavy duty 63mm cross pipes. Contoured main channel with heavy duty steel backing plate and tow pin. Custom driving light mounts to customer specification. 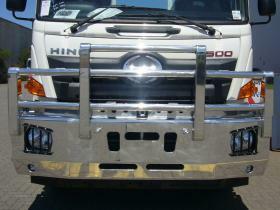 Hino GH Non Fups Polished Alloy Bullbar. features one piece 76mm heavy wall high tensile aluminium pipe which passes through the drilled centre box uprights and is recessed into the external uprights. Custom made removable grills protect the headlights which are still attached to the chassis. The heavy duty high tensile aluminium main channel is kept straight for maximum strength. Heavy duty 38mm tow pin is fitted through the high tensile aluminium backing plate. Driving light or light bar mounts can be fitted to suit customer requirements. 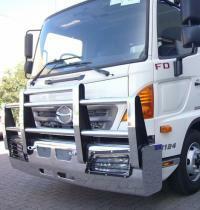 FD Hino 4 post hi-tensile polished aluminium heavy duty bull bar with I Beam style uprights. One piece heavy duty 63mm cross pipes. Contoured main channel with heavy duty steel backing plate. Custom driving light mounts to customer specification. Provision for light bar type driving lights as required. Tow hitch can be fitted as an option. 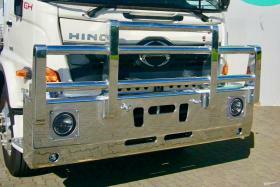 Hino 300 series hi-tensile alluminium bullbar. Heavy duty I-Beam uprights with one piece top cross tube. All cross tubes are constructed using 6mm wall high tensile material. 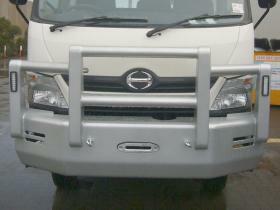 Additional headlight protection bars and lower skirt plus heavy duty backing plate result in maximum vehicle protection. Hino Dutro hi-tensile alluminium bullbar. Heavy duty box uprights with one piece top cross tube. All cross tubes are constructed using 6mm wall high tensile material. 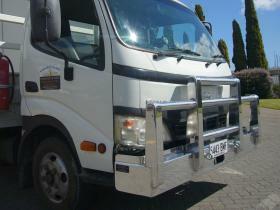 Heavy duty main channel with heavy duty backing plate with tow pin results in maximum vehicle protection. 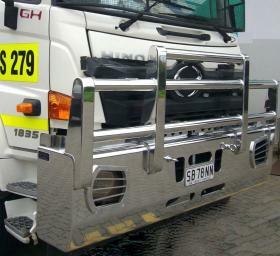 Hino GH 1828 Fups compliant Polished Alloy Bullbar. features one piece 76mm heavy wall high tensile aluminium pipe which passes through the drilled centre box uprights and is recessed into the external uprights. Poly Carbonate covers for custom fitted H4 headlights. The heavy duty high tensile aluminium main channel is kept straight for maximum strength and is fitted with extra reinforcing to customers reuirements. Heavy duty 38mm tow pin is fitted through the high tensile aluminium backing plate. Driving light or light bar mounts can be fitted to suit customer requirements. Hino 300 4x4 hi-tensile Alloy Bullbar with heavy duty box uprights and extra heavy duty 10mm thick pressed hi-tensile aluminium main channel. Features full length heavy duty box uorights and lower main protection. Heavy duty backing plate with 38mm tow pin. LED indicator lights are mounted in the outer box uprights. The main pipes are 76mm diameter heavy wall hi-tensile aluminium. 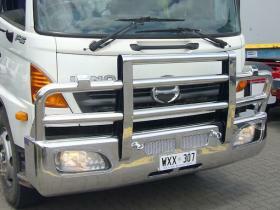 Hino 500 4 post hi-tensile polished aluminium heavy duty bull bar with heavy duty box style uprights. One piece heavy duty 63mm cross pipes. Contoured main channel with heavy duty steel backing plate and tow pin. Custom built removable headlight protectors. Custom driving light mounts to customer specification. 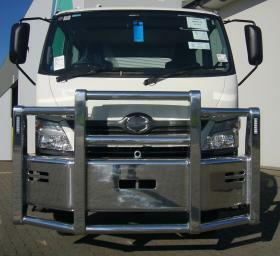 Hino FE 4 post hi-tensile polished aluminium heavy duty bull bar with heavy duty box style uprights. One piece heavy duty 76mm diam. cross pipes. Contoured main channel with heavy duty shigh tensile aluminium backing plate. Custom built removable headlight protectors. Combination indicator repeater and daylight running lights in outer box uprights. Provision for truck mounted Radar sensor. 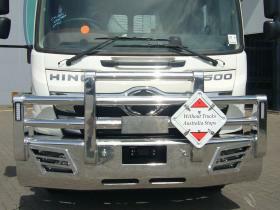 Dangerous Goods sign mounted on mounting plate. Custom driving light mounts to customer specification. 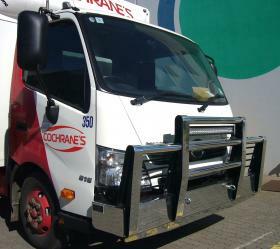 FG & FH Hino 4 post hi-tensile polished aluminium bullbar with I Beam style centre uprights. One piece heavy duty 76mm cross pipes. Contoured main channel with heavy duty steel backing plate. driving light mounts to customer specification. Tow hitch can be fitted as an option. Optional poly-carbonate headlight covers. Hino 300 4x4 powder coated hi-tensile Alloy Bullbar with heavy duty box uprights and extra heavy duty 10mm thick pressed hi-tensile aluminium main channel with a mounting for 17,000lb Sherpa winch. LED indicator lights are mounted in the outer box uprights. The main pipes are 76mm diameter heavy wall hi-tensile aluminium. Powder coating colurs can be chosen from a wide range to suit your requirements.